I have been thinking a lot about this lately, and when a friend said something unkind to me this weekend it sort of brought it home to roost. There was a time when I was very concerned about my looks and about having the best of everything. That time has passed as I have gotten older. As you know, if you have been reading my posts for the last week I am on a journey to rediscover the essential me. Inside there is the person that is my inner core, and while finding that core I am realizing that it has led to the person I am today. I have added to the essential core. There is a wisdom that has grown over the years and a settling of spirit. When I sit and recognize the person I have grown to be I feel an inner peace. I no longer feel the need to impress anyone by having the newest or the best. If I purchase something it is done to make me happy. 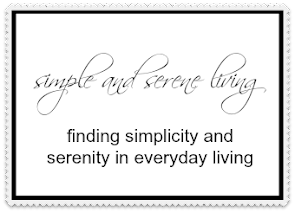 We all need to find that happy tranquil space within. The space that says I have grown to love the person that I have become. Beautifully and truthfully written, whatever that space is for each of us, and it will look different for us all. Let us allow ourselves to recognize the journey we traveled on and how brave we were to arrive where we are now and to love the older me. You have said this so well--we are who we are. Older, wiser and comfortable with ourselves. We must also have that perspective of others...that's a learning experience, I think. I hope it's something our 'years' make easier. So well said! I feel like a better person, happy with who I am, comfortable in my own skin. I am who I am and happy to be me.. The other gals have said it, not being concerned about our looks and what others think. The years have taught us well. In a way, it's to bad we don't have that when we are younger too. Very nice post Laura. I think life in later years is about who you have become and what you have accomplished with your life. Being comfortable and at peace with who you are. When a wrinkle appears I do not run to find the best cream to hide it I embrace it I earned every single one of the wrinkles. Shows you lived life. Well written post loved reading this today. I agree that you shouldn't care as much about certain things as you get older. You realize what's really important in life. I think it's a sign of maturity (in a good way). I've always thought it was strange when I saw an older person still hanging on to their youth and all the material things that seem to go along with it. It's like they're still caught up in "what's hip". I think that just stems from their own insecurity. I have alot of medical problems caused by an autoimmune disease. So, honestly, I'm just happy when I feel good! And you realize that while much of your personality and tendencies are the same all through life...so much more has changed that you can think of yourself as born again in a seasonal sense several times over your lifetime. Here I was as a kid, teen, young mother, here was my bad marriage time, my focus on little but work time, etc. etc. But there are common threads of interest running through all of those seasons...such as religion / seeking or a particular hobby such as gardening , and so on . Nice post and so true! Absolutely! 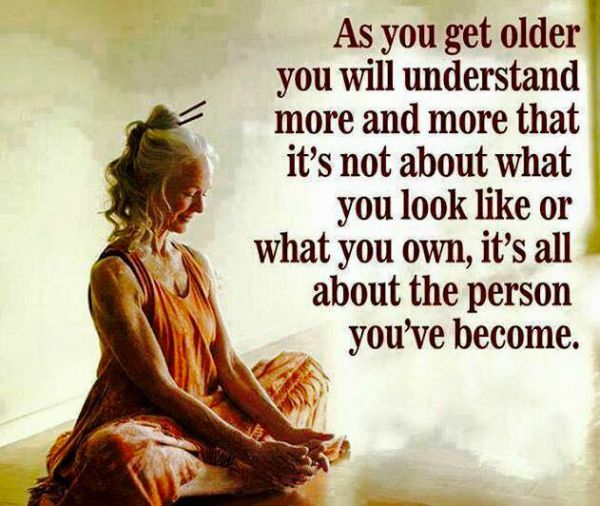 I find that as I age, I'm definitely more comfortable in my own skin and content with who I am. Well said, Laura. Hopefully, as we grow and mature, we also learn the power of forgiveness, as Christ taught us. It gives us an inner peace that otherwise evades us.